Armed men thought to be state agents arrested a Nigerian journalist, previously detained for more than two years, at a meeting with colleagues on Sunday, witnesses and watchdog groups told AFP. "Two DSS (State Security Service) vehicles... stormed the office" of the Bayelsa Federated Newspaper Publishers´ Association in Yenagoa in Nigeria´s southern Bayelsa state around lunchtime, as Jones Abiri was in a meeting with six colleagues, the association´s secretary general Eric Eweke told AFP. They "threatened that if tries to run, they would shoot at him," said Eweke. Another witness, who agreed to speak on condition of anonymity, said: "The men jumped out of the vehicles in a gestapo fashion while he (Abiri) was chatting with his friends and shouted at him that he was under arrest. DSS spokesman Peter Afunanya told local press "I don´t have any information" on the incident. 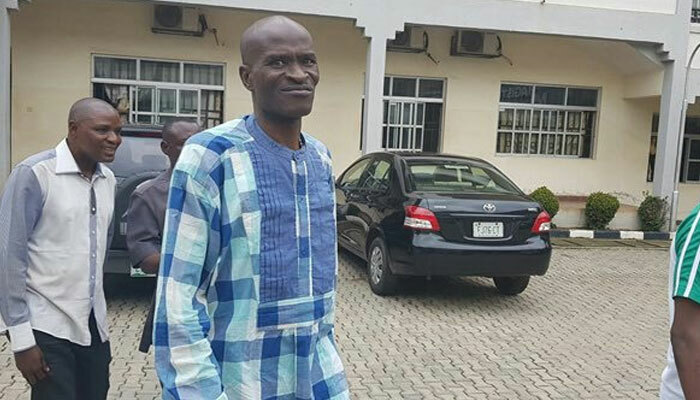 Abiri was previously detained by intelligence officers for two years without trial over alleged links to rebels in the Niger Delta in the country´s southeast and threats to oil companies. He had no access to a lawyer or his family during this time, according to the Committee to Protect Journalists (CPJ). He was freed in August last year following a campaign by rights organisations. CPJ Africa programme coordinator Angela Quintal said: "we are deeply worried that he has once again been arrested and that his whereabouts are not known. Abiri is the editor and publisher of the Weekly Source newspaper. Amnesty International also expressed concern over the arrest "by armed men suspected to be DSS operatives". "The humiliating manner of his arrest is unacceptable," it added. Reporters Without Borders places Nigeria in 119th place out of 180 on its World Press Freedom Index. It says journalists "are often threatened, subjected to physical violence, or denied access to information by government officials, police, and sometimes the public itself."